CARLSBAD — Grocery shopping is constantly evolving and one Carlsbad couple is taking advantage of growing awareness and legislation. California voters approved a single-use plastic bag ban in 2016 and retailers started selling reusable plastic bags for 10 cents. 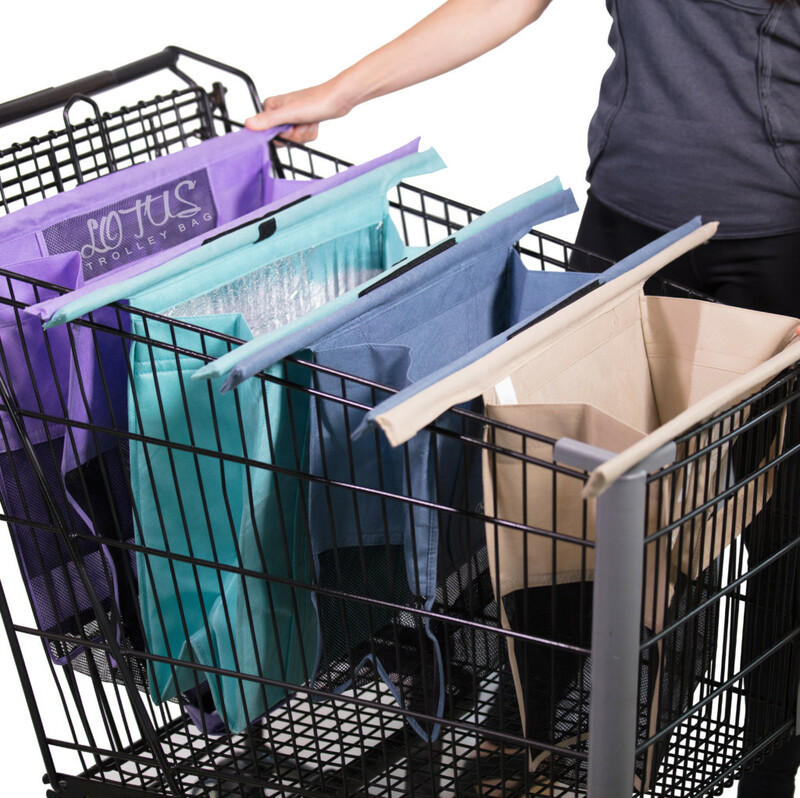 Farzan and Jennifer Dehmoubed saw opportunity in fabric reusable bags, but with a twist. The two created Lotus Trolley Bags, four bags that fold out like an accordion on the shopping cart. They retail for $29.95 in stores, $34.95 online and weigh less than two pounds. The Dehmoubeds also incorporated organization into their bags, after studying their own and others’ habits at the checkout line. Each bag has a specific purpose — one is a cooler bag for frozen items and meats, providing two to four hours of chilled groceries. Another has wine and egg pockets to go along with canned goods, and the other two are for fruits and vegetables. The business, he said, also takes on an environmental component, noting the average family uses 1,5000 plastic bags per year with an average use of 12 minutes. Many of those are for double or triple bagging items such as a gallon of milk. Additionally, Farzan Dehmoubed’s research found 100 billion plastic bags are produced annually for the U.S.
To date, the Dehmoubeds have sold about 20,000 Lotus Trolley Bags, which equates to a reduction of about 40 million plastic bags. They started the company in April 2017 and began production a month later. Additionally, media and blogs started picking up on the new bags, which gave the start-up life. The Carlsbad couple went with strength for their reusable fabric, which enables shoppers to carry about 50 pounds per bag. They said it cuts down on trips to the car, makes checkout faster and makes shopping easier and more organized. They are also making an impact with major retailers, with stands in Vons, Ralph’s, Albertson’s plus smaller stores such as Jimbo’s and Lazy Acres. They are in about 180 stores in California and 40 to 50 Natural Grocers Vitamin Cottage stores in Colorado. Through online sales, Farzan Dehmoubed said, the couple has noticed popularity in New York and Florida, the latter which does not have a plastic bag ban. But more states and cities are pushing for bans on plastic bags, citing detrimental effects to the environment and wildlife. Last week, a dead whale washed ashore in Thailand and researchers found 17 pounds of plastic inside the animal. Still, the Dehmoubeds said one of their main reasons for success is growing awareness of plastic bags. Farzan Dehmoubed said another is consumers are tired of storing dozens of plastics bags in their cupboards or storage areas. There is also a convenience factor, Jennifer Dehmoubed said. The bags are easily storable, compact and machine washable, thus not falling victim to mold.